This high profile annual gala takes place in a different Canadian city each year, in coordination with the Canadian Society of Association Executives (CSAE) annual conference. 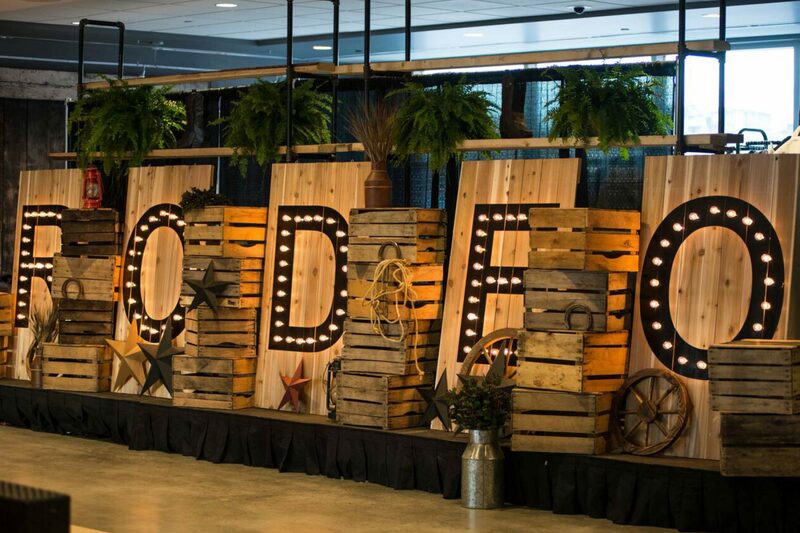 With Calgary as the host city, our client gave us two key objectives: 1) to provide guests with an authentic Calgary Stampede experience, with focus on the rodeo events, and 2) to provide guests with a full-service, sit-down dinner. 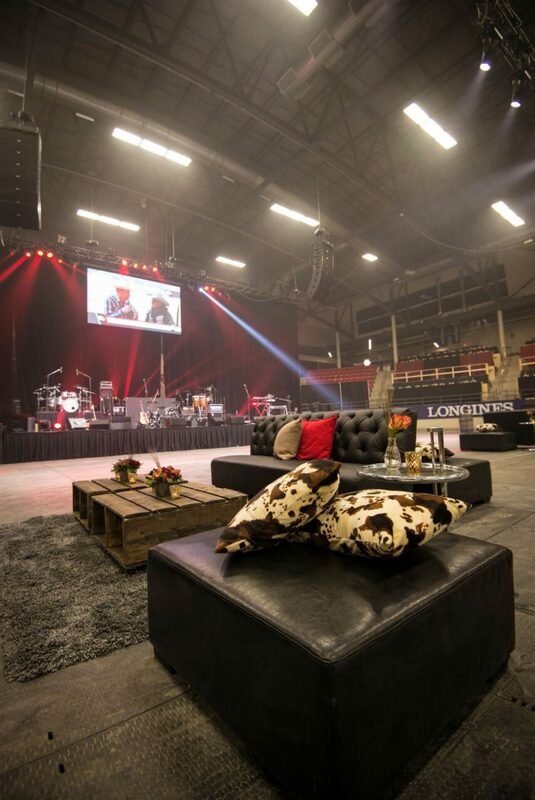 The event would be held in the Agrium Western Event Centre, and while the arena is perfectly equipped for a rodeo, it was not designed for seated dinner service. Our team joined forces with the venue and our suppliers to completely redesign the venue for this event. 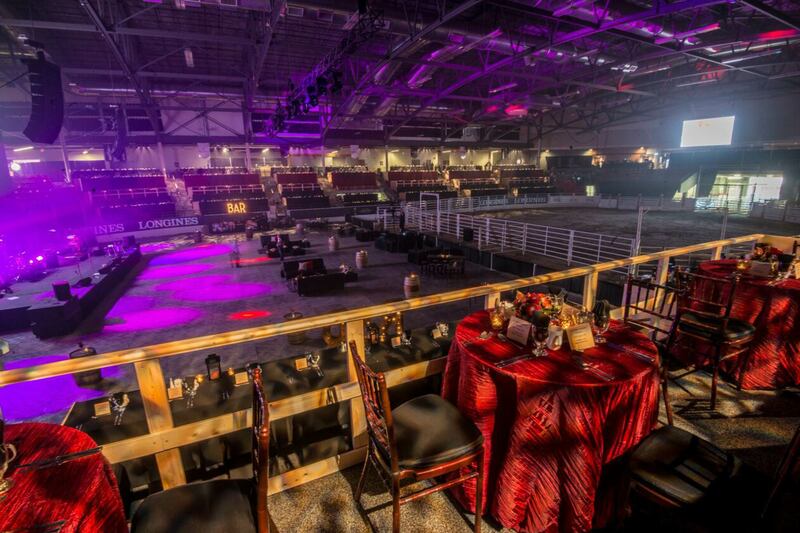 Our designers created a “Rodeo Dinner Theatre,” transforming the bowl around the arena into communal dining settings that allowed guests to watch the rodeo from their tables. Carpenters were contracted to build platforms over the arena seats, creating functional stage decks for dining. We created four levels of platforms for banquet tables, which were stylized with custom linens, chair covers, and thematic centerpieces. 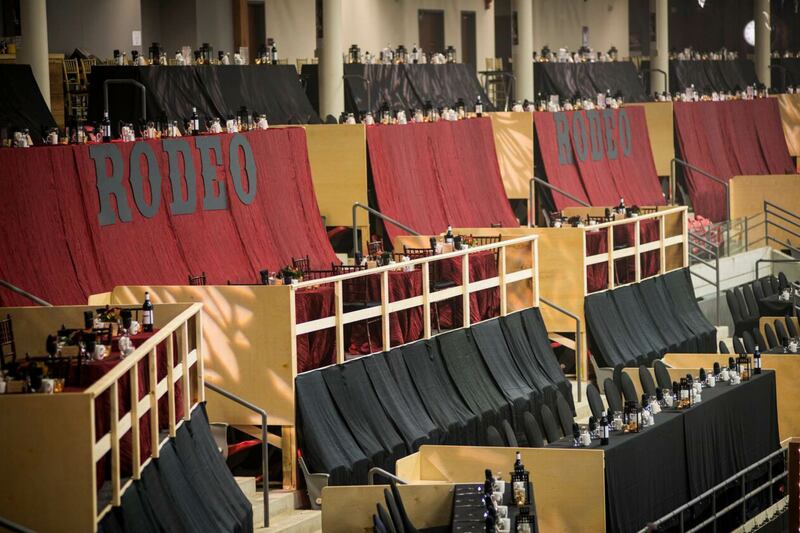 Custom-printed “RODEO” signs were suspended in front of cherry taffeta backdrops that could be seen throughout the circular venue. After the exceptional rodeo show, guests were invited down to the grounds for an after party. 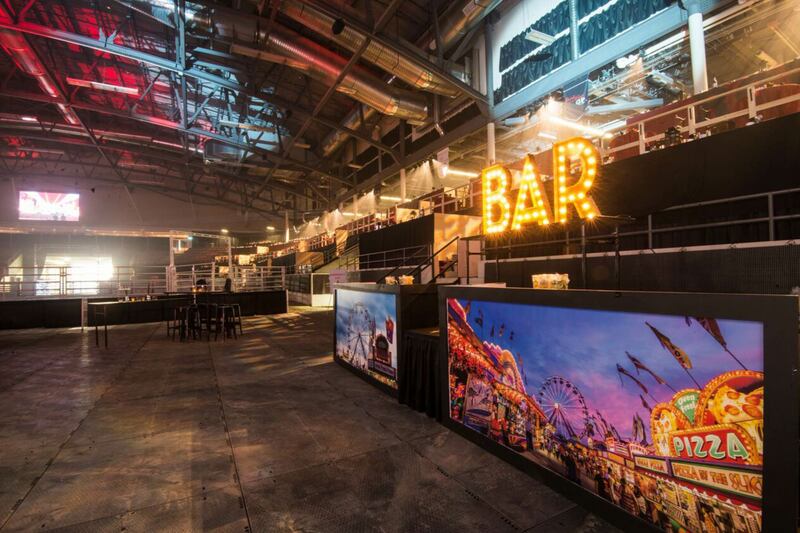 The design for this phase of the evening featured a stage, designer lounges, and bars decaled with a custom graphic of the Stampede Midway. This event took nearly a full year to plan, and in addition to the expected event logistics, we needed to accommodate another major challenge: the event would take place in the middle of the Royal West show jumping event at the same venue, which limited our time for set-up and tear-out. Countless production meetings, site visits, renderings, site plans, and production schedules ensured that this logistically challenging event was successfully set and stuck within 24 hours. 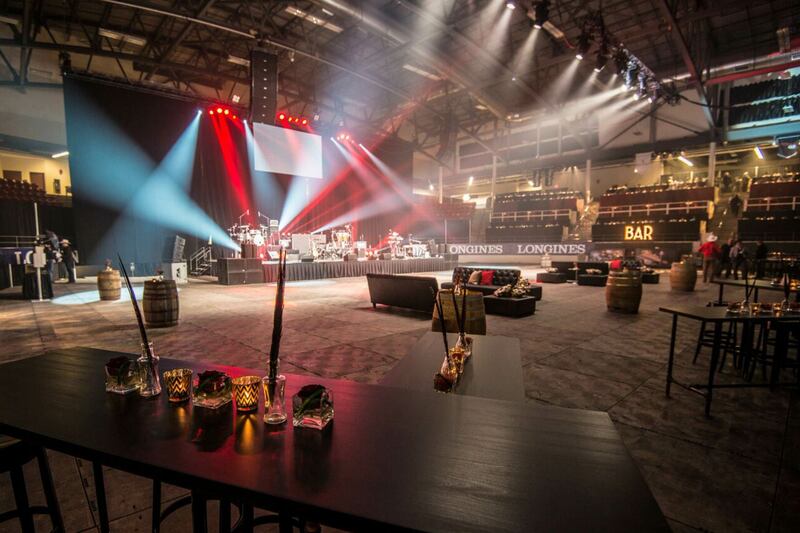 Our team transformed an arena into a stunning dinner theatre, literally overnight. 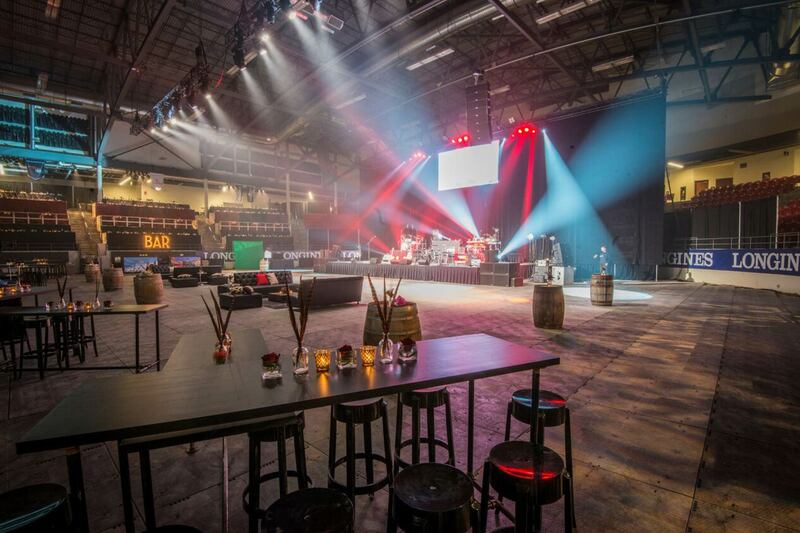 Our efforts exceeded client expectations, and showcased a completely new style of event for the Calgary Stampede. Nominated for logistical and event design awards, this event has received national recognition for the overall complexity, and professional execution.